So, I’ll not lie – you ain’t gona be able to pull this recipe off unless you’re growing your own courgettes…simple as that….or if you know someone you can rob them off!! Courgettes are bang in season right now so if you are growing you should have a healthy belt of flowers that otherwise will just wilt, die and head back to the soil. This recipe is a beezer way to intervene and make the very best from these little beauties. 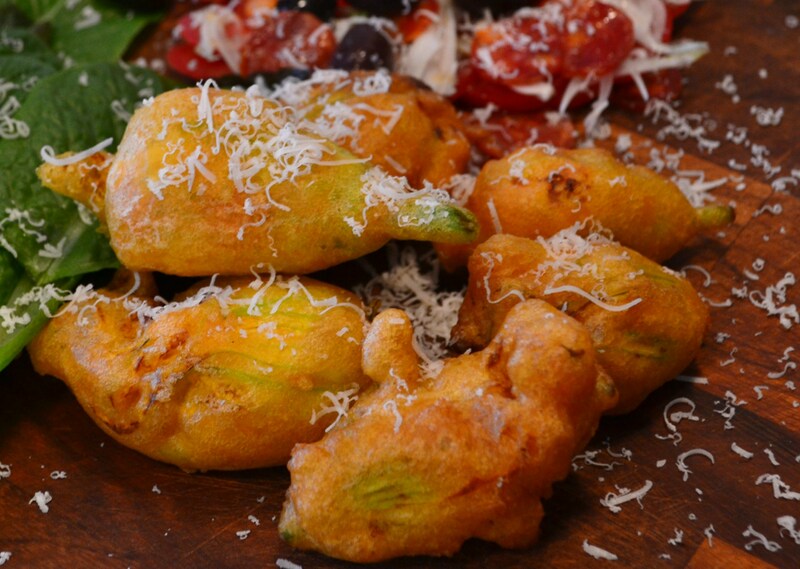 So kick things off by making the courgette flower stuffing – combine the cream cheese, goats cheese and chili – make sure the mix is well combined so use a fork. 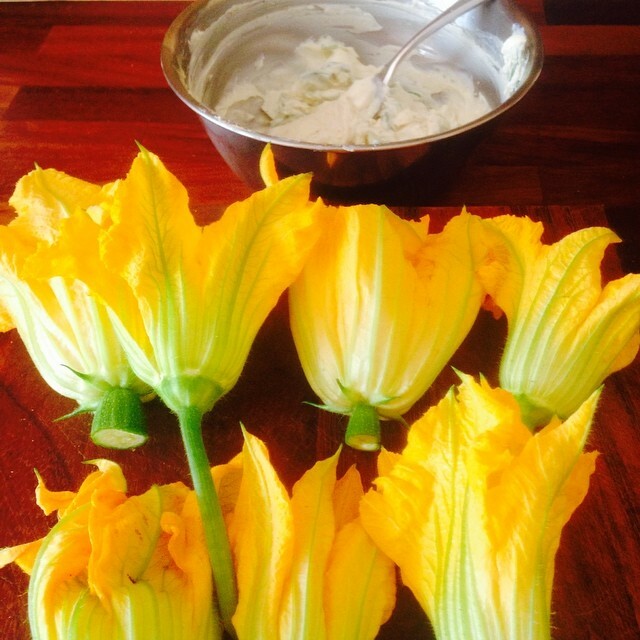 Season, taste, season taste until you are happy …..it should be creamy but punchy. Next lightly dust off the flowers with a pastry brush to loose any bits of grit or garden debris and also remove the little stalk inside the flower. Next gently spoon (or pipe) the stuffing into each flower and pinch the leaves closed – place in the fridge to firm up for about 30 minutes. Lastly make the batter – combine the flour with the sparkling water until you get a batter that’s the same consistency as double cream, season and your are good to go. To cook, bring about 4 inches of veg oil up to 190c, dunk the stuffed flowers into the batter then straight into the hot oil. Deep fry for about 3-4 minutes or until golden brown. So, here’s the trick……serve these as soon as they come out of the oil….do not hang around as you want to eat these babies whilst crunchy and the stuffing is oozy!! A masterpiece of timings. Time to plant some perhaps? Might be a bit late Conor, I was about 1 month out with mine but thankfully that warm spell we got saved my bacon….well…..courgettes! Robbing them is the only option… or pay STOOPID money at the ‘farmers’ market!